Preheat oven to 220°C (425°F). Place the couscous and water in a medium bowl, stir to combine and cover tightly with plastic wrap. Set aside for 10 minutes or until tender. Fluff the couscous with a fork and stir through the pistachio, parsley, lemon rind, garlic, salt and pepper. Spoon the couscous stuffing into the cavity of each spatchcock and secure the legs with kitchen string. Place on a baking tray lined with non-stick baking paper, drizzle with the oil and sprinkle with the salt and pepper. Roast for 30–35 minutes or until golden and cooked through. 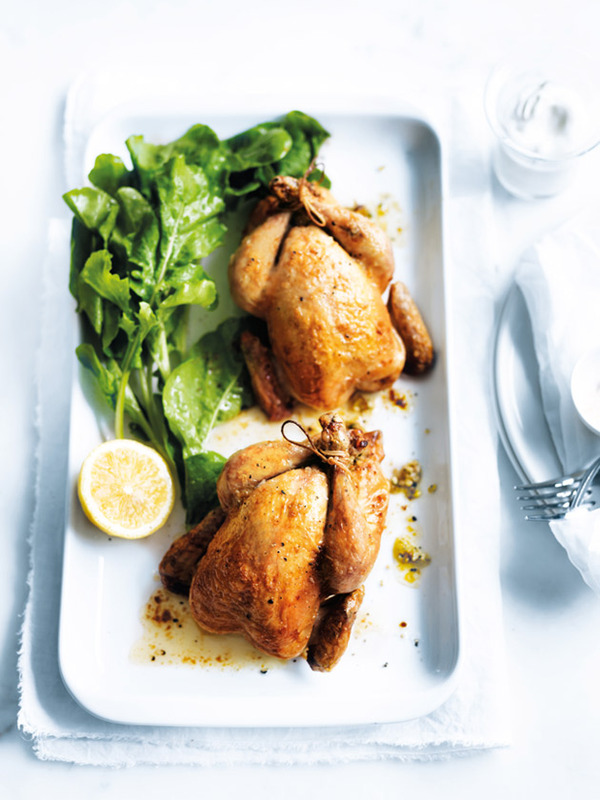 + Spatchcock is a young chicken that has been specially prepared to make roasting or grilling easier. They are available from most supermarkets, poultry stores and butchers. Tip: the spatchcocks can be stuffed a day in advance. Keep refrigerated until ready to cook.